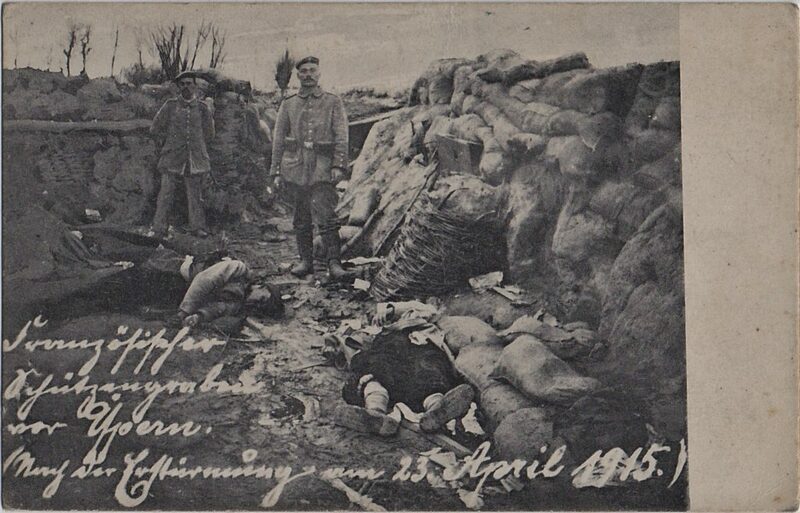 Another newly acquired postcard, and again an image I haven’t seen anywhere else, this view of a captured French trench near Ypres was taken the day after the Germans’ first ever use of gas on 22nd April 1915, at the start of the Second Battle of Ypres. It was the French Algerians who took the brunt of the gas attack, and the Germans in the photograph stand over two of the unfortunate Zouaves who died having little or no idea what was happening to them, as the pale green cloud washed over them and the hydrochloric acid began to form in their lungs. Many fled, but clearly these brave men didn’t. I cannot fathom the tortures the French Colonials, and Canadians on their immediate right went through in the minutes, hours, and for some days, that went by before the relief from the yellow clouds that enveloped them. On this Remembrance Day 2016, I remember St. Julien, and the somber stone soldier who stands guard there for his lost comrades still. Thank you John. As always.